The SEAT Leon ST estate car is practical and spacious with good performance levels. 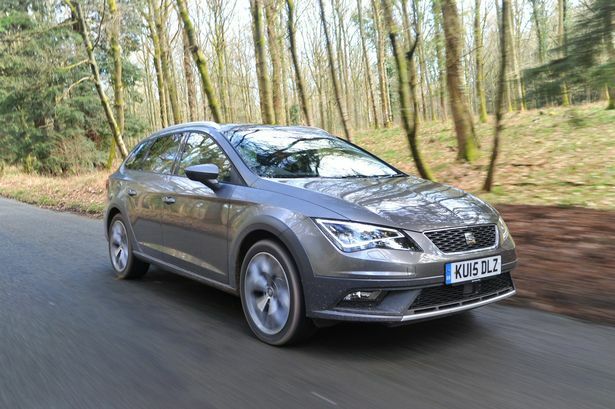 Spanish car maker SEAT has launched a stunning up-market version of its popular Leon ST estate car – and it comes complete with all-wheel-drive. The Leon X-PERIENCE SE Technology is right at the top of the price list of Leon models at just under £29,000 and as such is aimed at a niche market. Designed as a lifestyle model it sits higher off the ground than the standard ST estates so has more ground clearance for buyers who do need to tackle off-road work. It’s not aimed at serious off-roading but the extra grip of the all-wheel drive makes it perfect for motorists whose leisure activities mean they need to leave the highway to get to horses, boats or caravans etc. More soft-roader than off-roader. Under normal driving the X-PERIENCE operates as a front-wheel-drive car thereby keeping fuel consumption low. But when the Haldex four-wheel-drive system – the same one used in the Audi Q3 – detects any loss of traction on the front wheels it gets you out of trouble by transferring as much power as needed to the rear wheels. This spacious estate comes with a choice of two powerful 2.0-litre diesel engines, one offering 150bhp the other with 184bhp. If you opt for the more powerful of the two, which is tested here, you get a six-speed DSG automatic gearbox as standard. And while we’re talking about a very practical estate car here we are also talking about a very quick one. In fact considering the extra weight of the four-wheel-drive system the Leon X-PERIENCE is a very sporting car indeed, hitting 62 miles per hour in just 7.1 seconds and going on to a top speed of 139mph. Not your average load lugger. The six-speed auto box is seamless but if you really want to up the action just slip it into Sport for real “throw you back in your seat” performance. There are also paddles behind the steering wheel for manual gear changes and at times on this car I found these particularly useful when trying to boost the economy or trying to out perform the Sport setting. The sporting performance of the X–PERIENCE is reflected by the car’s interior, with its sports seats with good side support and a small leather steering wheel with red stitching. Standard features allow you to set up the car’s handling to suit yourself, with the choice of eco, normal, sport or individual settings so you can change it as your mood or needs alter. With the car in eco you still get excellent performance but with the bonus of the coasting feature now used on cars in the Volkswagen group. Every time you take your foot off the accelerator the drive is disengaged – just as if you had put the car into neutral – and you coast, thereby saving fuel. And on a long journey it makes a dramatic difference. My test car came with the Lux Pack, which meant black leather upholstery, electrically adjustable driver’s seat and heated front seats as well as chromes roof rails. It also had SEAT’s electric panoramic glass sunroof (an extra £1,050) which stretches the whole length of the car and is great for rear seat passengers when you drive through an area with mountains or tall buildings. Standard features include satellite navigation and LED headlights. The Leon ST is a very practical estate with generous leg room and luggage space – 587 litres with the rear seats upright and 1,670 litres with them folded down – but the X-PERIENCE versions takes it to a new level both in terms of performance, handling and upmarket features. But like everything in life the best comes at a higher price. Mechanical: 1968cc, 184bhp, 4 cyl diesel engine driving all wheels via 6spd DSG gearbox.